What’s really happening to your body as you soak away your stress in a jacuzzi? Here’s the science behind the serenity of the jacuzzi. There’s nothing better than a massage to ease aching muscles after a long hard working day. But you don’t necessarily need to book in with a masseuse - the use of water to treat the body is as old as time and still practiced today to aid the body of many different problems. Jacuzzis use hydromassage to stimulate muscles. At a temperature of around 100°F-102°F, the warmth gets to work relaxing the most stressed muscles, while hydromassage increases blood flow and rids the body of toxins. Toxins and restricted blood flow can be the cause of pain and inflammation, so regular jacuzzi use is excellent for improving our health. The use of cold and hot jacuzzi therapy is said to have improved the performance of the most prestigious athletes. Sportstars such as Sally Gunnell, Troy Murphy and Amy Purdy have all reached excellence in their fields and have all used jacuzzis as part of their performance regime. 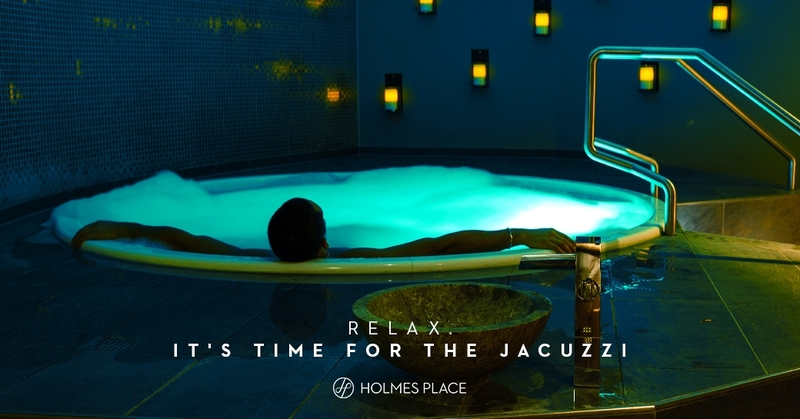 Finishing your workout with a bubbly jacuzzi in a Holmes Place wellness spa can help get rid of soreness and can be the perfect reward for a sweaty session. Getting rid of stress is vital for everyone, but it’s often overlooked, minimised or left until we reach a crisis. Regular relaxation, such as chilling out in jacuzzis, should be an integral part of your life - as important as exercise and healthy eating. It’s one of the top benefits of jacuzzi use, thanks to a combination of heat, massage and buoyancy help to clear the mind and relax. As well as offering the comforting feeling of serenity, jacuzzi jets also ease knotted stressed muscles muscles, making you feel brand new. It’s always necessary for you to consult with your doctor before using a jacuzzi if you’ve been diagnosed with a heart condition. Jacuzzis can increase your heart rate and lower your blood pressure by dilating blood vessels and easing pressure to the heart . Hydromassage jets combined with the warm water increases body temperature, helping to dilate blood vessels. This improves circulation of the blood and is beneficial to those with conditions such as arthritis, easing movement in water. The gentle caressing of the bubbles will only add to the benefits of joint and muscle stiffness. Again, medical advice should always be sought by those with blood pressure difficulties prior to the use of jacuzzis. A study by the University of Surrey shows how poor or disturbed sleep can have a profound negative impact on our overall health, with findings showing that hundreds of genes were affected in people having less than six hours sleep a day for a week. Resting in a jacuzzi is beneficial to a good night’s rest, thanks to all the aforementioned benefits such as relaxation, circulation and massage. Raising the body temperature and de-stressing brings a wholeness to our soul, body and mind and can only be a good thing so for those who struggle to find a good recipe for sleep. It might even lengthen your life. Posted in Wellness and tagged Spa, Jacuzzi, Health, Beauty , Relaxation, Stress.